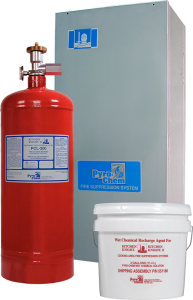 When you need a restaurant fire suppression system we will install and maintain the best fire suppression systems manufactured today, including ANSUL and Pyro-Chem. ANSUL is the #1 food service fire protection solution in the world. All of our technicians are manufacturer trained and certified to do semi-annual inspections and keep you compliant with state and local fire codes. 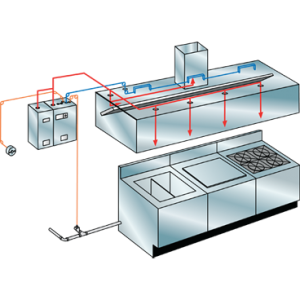 The PIRANHA Dual Agent Restaurant Fire Suppression System employs the best firefighting attributes of two extinguishing agents: the fast flame knockdown and securing power of wet chemical and the fast cool-down capability of water. The system provides protection for settings such as casual and fine dining, fast food chains, culinary schools, sports complexes and stadiums, and four- and five-star lodging facilities. 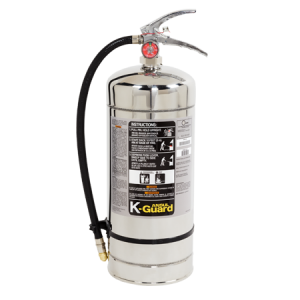 oils, require a fire extinguishing agent that will not only smother a fire but also provide a cooling effect.